Last night the big ice storm hit us, sadly we had to slip and slide to class. It was HORRIBLE. I have NEVER seen it this bad before. I finally made it home, called my boss, told him i didn’t want to drive anywhere, ordered pizza and was about to march up to my warm cozy bedroom. 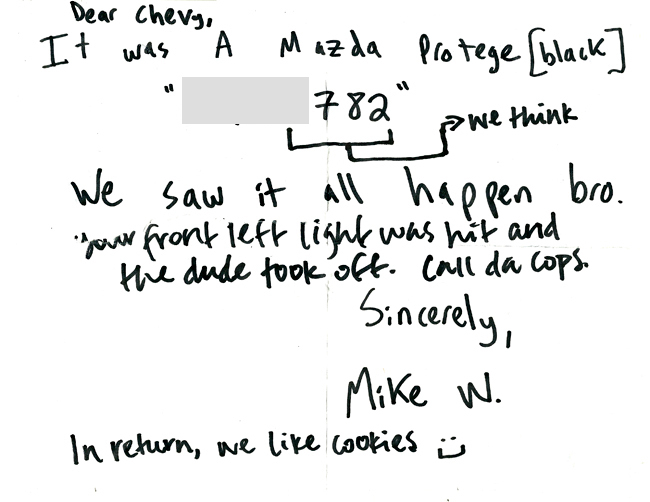 Then, one of my roommates “had to show me something.” They informed me of a note that they just found on my car. My poor beat up Cavalier is parked out side of our house on the street covered in an inch of ice. This is why I didn’t want to go to work in the first place!